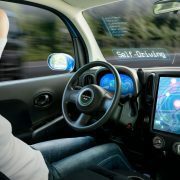 If we listen to some of the futurists and tech pundits, very soon, we will all be sitting back in the driver’s seat and letting the autonomous car do all the work. In this brave new world, there will no road fatalities, traffic will flow smoothly and we will all arrive at our individual destinations relaxed and on time. Like all utopian dreams the impact of the single most troublesome variant is often omitted. Humans. Humans with individual needs, desires, objectives, with their capriciousness, unpredictability, selfishness, inattentiveness and competitiveness. All of which any autonomous vehicle system will have to cope with. Even if we were to ban all direct human control of motor vehicles (and that’s just not going to happen) humans will still share spaces with such vehicles, interact with them and come up with incalculable variations as to what they expect such vehicles to do for them. Otherwise they will not be individual vehicles at all, they will be public transport – with all the predictability yet limitation that entails. The technology to allow vehicles to be partially, even largely, autonomous already exists. What does not is an agreed public policy and regulatory framework for the operation of such vehicles nor the closed systems within which they can operate free from the risks of human vicissitudes. In an ideal scenario autonomous vehicles will talk to each other, operate within a network that has infrastructure also providing interactive information, plan and execute trips based on individual choice yet consistent with capacity, and prioritise user and community protection. Never mind that there can be cases where that last dual requirement is not easily reconciled. No road fatalities, even within an autonomous system, is impossible. Yet the argument runs that the fatality cases will be so few that the larger gains justify the far lesser exceptions. But who makes that ethical judgement? Moreover, who takes responsibility when things inevitably, go spectacularly and tragically pear-shaped. One of the luxury car companies recently issued a very brave statement saying that they would take full responsibility for any failure, causing accident, of one of their vehicles operating in autonomous mode. Quite apart from the lawyer’s picnic that can be had from the effort to define both failure and cause, any company with international exposure would soon find even a tiny percentage of incidents within their global fleet enough to drown them in claims. The truth is that fully autonomous private motor vehicles (that is running all the time autonomously) is as much science fiction as the flying cars of the Jetsons. Yes, there will be more and more sophisticated ‘driver aids’, many of which will allow full autonomous operation in certain circumstances, under certain conditions and with certain supporting infrastructure. Yes, there may even be closed systems – such as inner city grids – where only vehicles that can be switched to autonomous mode will be allowed to enter. There may well be a day when all new cars and heavy vehicles will have such capability. However, so long as there are humans in the mix, there will remain the need for personal responsibility and ultimately, intervention and control. The more likely outcome is a sensible combination of both improved vehicle capability and improved infrastructure allowing for opportunities to decrease road trauma whist increasing efficiency. To say nothing of better driver education and increasingly convenient public transport options. We already have a closed system mass transport platform where the operating vehicles can perform the tasks assigned to their human controllers, without intervention. The air transport system. Yet pilots not only remain in the cockpit they also continue to carry individual responsibility for controlling their aircraft. At all times! Can’t see that changing anytime soon. RMK+A consults widely to automotive businesses on matters of vehicle industry and transport public policy and government engagement.